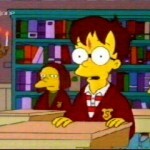 Two major Harry Potter parodies/references have appeared in The Simpsons over the years. Below you’ll find screenshots from both. Bart and Lisa attend, “Springwarts School of Magicry”. View screenshots from this episode. 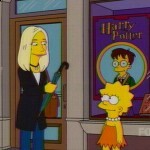 The Simpson family take a trip to England where Lisa meets J.K. Rowling.